The ultimate in first class yacht provisioning, the ID Offshore provisioning service will ensure we can meet all of your needs even when the yacht is anchored offshore. The ID RIB has been manufactured by world renowned British boat builders Hunton and custom designed specifically to be able to carry provisions in temperature controlled conditions. There is a 650L fridge locker built into the bow of the tender where fresh produce can be stored whilst in transit, as well as clip in marine cool boxes - ensuring all goods are delivered to the yacht in perfect condition. We understand what a challenging environment operating a Superyacht can be in Ibiza and the pressures which are placed on your tenders. The ID tender can be chartered as a support tender and used by the yacht to assist with transfers, provision runs or for unseen emergencies. 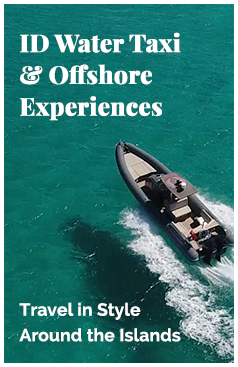 The tender has a capacity of 8 people and the skipper is a highly qualifies yachtsman, with over 10 years industry experience. The ID tender can be hired as a water taxi and used to help ferry your guests to and from the Superyacht or around the islands. The tender carries up to 8 people and will ensure your guests are transported in safety, comfort and style. Guests will be offered a chilled face towel on arrival and can order a drink from the on-board bar service which is sponsored by Perrier-Jouet. Soft drinks, water and beer are complementary with the service and guests can purchase Made In Provence rose wine or Perrier-Jouet champagne. The ID tender can be chartered to support the crew with collection and delivery services. We offer a laundry collection and drop off service and will ensure that your laundry is laundered to the highest standards. We also offer a rubbish collection service, however this needs to be booked at least 24 hrs in advance. Please note, we can only carry a maximum of 25 rubbish bags at any one time so may need to do additional runs if there is a need to collect more than this. The tender can also be used for ad-hoc emergency needs such as the collection of an important letter or package. Our team will then ensure that it gets processed correctly at the courier office.